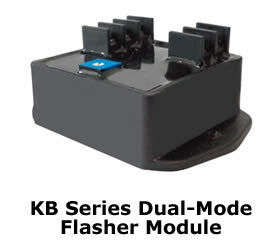 The ICS KB Series Dual-Mode Flasher provides both symmetrical flashing and fixed on-time (pulse) flashing. The cycle time is adjustable from 1 to 10 seconds. Flashing mode is set by a jumper on the terminal block. This module can be used to flash most incandescent and LED lamp loads. It can also be used as a recycle timer to cycle other types of loads. The control board is epoxy-potted in a sturdy case with two mounting holes. Timing: 1 sec. to 10 sec. cycle time (period). Custom voltage/timing available. Timing Adjustment: Trimmer adjustment, also available as a fixed timer. Temperature Range: -20ºC to +55ºC operating, -40ºC to +85ºC storage. Contact Rating: SPST Contacts 15A @ 240VAC (resistive), 15A @ 28VDC (resistive), max inrush current (incandescent load): 80A peak 20mS. Supply Voltage Range: 10.2VDC to 15VDC. Install jumper for Mode 2 Operation.